As I write this article it is late summer and its hot, really hot! Over the winter months I performed several experiments while training to monitor how heat impacted my performance. Let me be very clear on what I mean by experiment. I didn’t use a detailed or written test protocol that I can share in this article. I am planning on doing this but don’t have it yet. So think of this article as the precursor to that data. What I did, is one weekend I rode my rollers to perform 2×10 intervals. The warm up was 15 minutes in length and each 10-minute interval was ridden at 95% of my Threshold Power the rest interval was 5 minutes of Zone 2 Power. The room has one door and admittedly a rather weak floor fan. I experimented with fan positions and found that having it behind me and pointed at my back created the greatest cooling effect. I had my usual sports drink mix loaded down with ice and was taking a sip every 3-5 minutes. I was able to complete the workout albeit sweaty and hot but complete it with results I had hoped to see. The room temp was 71* F to start and 75* F at finish. The next weekend I performed the same test with the same set up minus a fan and ice in my sports drink. The results were horrendous. Eight minutes into the last 10-minute interval I was seeing spots and was ready to fall off the rollers. The room temp was 71* F to start and almost 85* F to finish. So this simple test tells what most of us already know. Heat can and does impact the performance of any athlete! When I do this test again I am going to use a ramp test on an ergometer and make incremental measurements of core body temperature as they pertain to each 1-minute ramp in effort. This way I can show how heat impacts performance. I also hope to test several different methods of cooling that are being used by medical and sports medicine doctors. What got me thinking about core temperature and performance? Well with age and years of training I have become what my doctor calls an efficient sweater. Basically I sweat a lot during training and competition. I have also noticed how myself and other athletes I work with that drink cooler drinks in the summer will see improved performances. So I started to look into other ways of cooling the core temperature. Not only for better performance but also to increase the enjoyment of sport and reduce the risks of heat related illnesses. Cryotherapy is the local or general use of low temperatures in medical therapy. However when it comes to athletes the latest use of Cryotherapy is either a whole body concern or used to treat the lower extremities. Look for more and more training facilities to offer Cryotherapy. The WBC therapy equipment is quite expensive and out of the reach of even most professional athletes. It has been reported that working with a professional at a Cryotherapy center may set you back as much as $75.00 per session. Another form of Cryotherapy or Cold Therapy is the dreaded ice bath. Ice baths are cheap and relatively easy to set up but are not with out risks when performed by individuals with little or no experience in the protocols. Ice baths like WBC are believed to Speed Recovery, Reduce Inflammation, Lessen Muscle Soreness and may even help you to sleep better by cooling off your “metabolism”. Some of the dangers surrounding ice bathing are the Initial Pain of Immersion, Breathing Difficulties, Hypothermia, Frostbite and Shock. Even with these drawbacks the benefits reported by athletes are hard to ignore so how can an athlete mitigate the risks associated with ice bathing? It’s OK to get out sooner. Not everyone can handle 8 minutes!!!! DO NOT RUSH TO TAKE A WARM SHOWER. Warm up gradually using a blanket and or sweatshirt and sweatpants. You can draw your own ice bath at home or even at your hotel when traveling. Just fill the tub with cold water. Measure the temp of the water and then add ice until you get the temp with in the ranges mentioned above. Colder is NOT better!!! I also strongly recommend that you keep water in the 55* F – 60* F below the level of your heart to reduce the chances of shock. The other methods I have been reading about that I would like to further test is the benefits of pre-cooling the core before training and racing begin. The most common method is using a cooling vest. Cooling vests use many different methods for maintaining or reducing the body’s core temperature. Some contain special gels and ice that when wet will use evaporative cooling to cool the core. Some vests actually pump continuously chilled fluids to lower the body’s core temperature. A newer and novel method uses a glove under vacuum placed over hand that is also fed a continuous flow of chilled fluid. That may actually cool the core faster than any other method mentioned in this or any other article I have read. So why would an athlete want to pre-cool before training or racing? Imagine the best run, ride or swim you have ever had outdoors it was likely achieved at your peak fitness and cooler temperatures. Wouldn’t it be great to show up to the line of the start of the race not feeling hot and being able to race for at least part of race with out feeling like your brain and internal organs were cooking? There in lies the problem with pre-cooling it won’t last the entire duration of most distance events. So what is an endurance athlete to do? You can keep cooler pre race, in race and post race. Introducing the most inexpensive solution, the Ice Sock! The Ice Sock is the simplest way of pre-cooling and most affordable. I started purchasing inexpensive thin dress socks and filling several with ice. I then tie the other end in a knot and drape it around my neck and stuff it under my jersey while warming up for a race and for races too. I have also just recently begun to use them after a race. Granted the ice socks are almost completely melted after a 20K Time Trial lasting 30 minutes or less I will also be using these in shorter circuit races and criteriums with those that I coach next summer. So did using an ice sock really help me in my most recent Time Trial? I have been very surprised by the results. In the middle of the week I participated in a hilly time trial where I did not use an ice sock pre race or during the race. The race was about 85* F with very little humidity and about 6-7mph winds. I had descent times, improved average speed, improved my FTP by 2 watts and increased my Normalized Power by 6 watts since a similar TT 2 week’s prior. 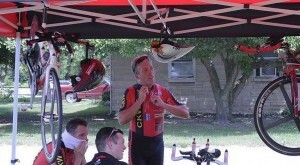 4 days later I participated in a flat 20K TT at 91* F with a bit more humidity and similar 6-7mph winds. I increased my FTP by 4 watts, my Normalized Power increased 10 Watts and I cut more than minute off my best time on this course. So can I explain my added improvement in power to training, diet and rest? If there were more than a few weeks between each race I would say yes but not in 4 days! So I am giving the nod to pre cooling and race cooling via an ice sock. Want more information on the above check out the following and look forward to my posts on my late season experiments. I am having a hard time with understanding the benefits of the cryotherapy. The initial shock of the sub zero temperatures would cause the capillaries of the skin to constrict causing blood flow to slow or stop. The benefit wouldn’t be realized until you came out of the cryotherapy and the skin started to warm allowing the cooler blood to start circulating. The same benefit would be realized in an ice bath or with an ice sock ( I really liked that idea by the way) for a lot less money and with a lot less risk to the skin and underlying tissue. Hi Dean, I see your point and it was dealt with the ice glove by applying a vacuum so that the blood vessels would not constrict. I am guessing that the larger Cryotherapy chambers are cooling across the entire body so that while some blood vessels will constrict others may not? Especially since its cold air not water that is passing over the skin? Not sure.